It's never too early to start thinking about Christmas gift ideas. Give the gift of Language! Give Ectaco, the Perfect Gift Idea! Before you know it, the winter holidays will be upon us and with them the inevitable rush to find the perfect Christmas gift, Chanukah gift or New Year's gift for that special someone. We at Ectaco think that our electronic dictionaries are the perfect gift idea for just about anyone. Students, businesspeople and travelers alike find our products to be easy, effective and convenient communication helpers they use the whole year round. So, save yourself all the bother, avoid the rush and choose that perfect Xmas gift right now, in the comfort of your own home. Handheld Electronic Dictionaries are the perfect Christmas gift idea or Chanukah gift for your friends and loved ones on the go. 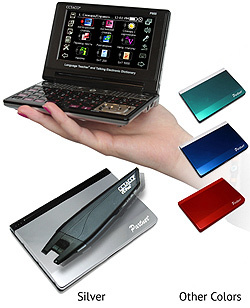 Fully portable and easy to use, they provide access to the world of languages in a smart and stylish package. Students will enjoy the wealth of resources they include while travelers of all ages will love the freedom they offer and how much more convenient they are than old-fashioned paper dictionaries and phrasebooks. And the busy professionals on your shopping list will appreciate the handy organizer features that will help them stick to their New Year's Resolutions and stay on top of things. In fact, everyone will find something to love about these unique and thoughtful Christmas gifts. And of course they're not only suitable for Christmas gifts but as Chanukah gifts and New Year's gifts too! So give a present that keeps on giving and have your friends and family thanking you every day of the coming year. Shop early. When you wait to buy your Christmas gifts until the last minute, you are constantly fighting crowds, traffic, and time. With all that pressure, finding that prefect gift idea can be very difficult. It is much easier to save money when you have time to consider your options. Ectaco can help by offering you the best Xmas gift ideas that you can take advantage of from home. Simply put, buying from Ectaco gives you the chance to find that perfect Christmas gift without the pressure. And our wide selection will let you cross several names off your Christmas gift list at once! Do your homework. Starting early gives you lots of time to come up with the best Xmas gift ideas, compare prices and find the best deals around. Buying Christmas gifts and Chanukah gifts from ECTACO provides you with the best prices because we are the manufacturers and can offer the lowest prices and deepest discounts on all our products. Don't pay more than you have to! And remember, with Ectaco you save money not only on the Christmas gifts but on the shipping costs too! As we all know, Christmas is the busiest time of year for the post-office and courier services. And while we can generally estimate delivery times relatively accurately, we too are at the mercy of the post. So searching for Christmas gift ideas early can help avoid disappointments on Christmas morning. The Best Holiday Gift for everyone! jetBook mini Protective Case (£ 10 value) is yours as a gift! ECTACO jetBook mini Anthracite Black Read more for less! The jetBook mini is the most affordable, lightest, and versatile e book reader ever made. Tweaking energy consumption to its absolute minimum, the jetBook mini now runs on 4 AAA batteries (Energizer Lithium batteries included) and lasts up to 90 hours of continuous reading! The new Partner 900 series devices represent some of our most advanced handhelds. Available in regular and Deluxe versions, they include everything you need to communicate and learn a foreign language. With their unsurpassed language management utilities, the 900 line offers a range of the most sought after resources including unbeatable talking translating Dictionaries, an Audio PhraseBook with over 14,000 pre-recorded phrases spoken aloud using True Voice human pronunciation, advanced Speech Recognition modules and a Talking 39 language Picture Dictionary with pronunciation for all words. In addition to a customizable bilingual interface and robust Audio and Video players, Partner 900 series devices also include our patented Language Teacher and U-Learn systems and the popular jetBook e-Book reader plus loads of extras. Available in a choice of fashionable colors that include Candy Red, Caribbean Blue, Colorado Gold, Brazilian Green and Antique Bronze, you can also personalize your 900 even further with a unique engraving service that lets you add the text of your choice to the front cover. ECTACO Partner EW900 Deluxe Multilingual Talking Electronic Dictionary and Audio PhraseBook This Windows CE powered handheld is the smartest new device from the remarkable Partner series and provides unlimited translation and communication possibilities. ECTACO Partner ER900 Deluxe - English <-> Russian Talking Electronic Dictionary and Audio PhraseBook with Handheld Scanner This Windows CE powered handheld is the smartest new device from the remarkable Partner series and provides unlimited translation and communication possibilities. ECTACO Partner EA900 Deluxe - English <-> Arabic Talking Electronic Dictionary and Audio PhraseBook with Handheld Scanner This Windows CE powered handheld is the smartest new device from the remarkable Partner series and provides unlimited translation and communication possibilities. ECTACO Partner ES900 Deluxe - English <-> Spanish Talking Electronic Dictionary and Audio PhraseBook with Handheld Scanner This Windows CE powered handheld is the smartest new device from the remarkable Partner series and provides unlimited translation and communication possibilities. The ECTACO iTRAVL is the world?s most sophisticated, all-in-one multilingual travel and communication handheld. Providing everything you could possibly need when visiting a foreign destination, iTRAVL helps you to get your message across quickly and easily. Using an unbeatable combination of the most advanced speech recognition modules and high-definition recordings of authentic native speakers, iTRAVL understands when you speak any of its thousands of pre-loaded phrases and provides you with a crystal-clear spoken translation in whichever foreign language you choose. That means that simply by speaking into the device you and your listeners will be provided with a real-time, completely intelligible response that anyone can understand. Offering a whole host of travel and learning resources in one small, pocket-sized package you will always have access to the most up-to-date information on restaurants, hotels, transportation and much, much more. Once you return home, you can use iTRAVL to learn a new language, communicate with foreign business partners and loved ones, or simply use it to listen to your favorite audio files. Sleek and portable, the iTravl is the perfect gadget for on-the-go language communication or learning. Speech recognition allows you to say thousands of phrases with a dynamic multi-step language learning system to help you start speaking instantly. Learn a language or just speak one right now. The iTravl is a complete language teaching and translation system. With its portable design you can take it anywhere, learn a language on your flight across seas or just let the iTravl talk for you using its Audio Phrasebooks and advanced speech recognition. The Partner 500 series is our new generation of handheld talking dictionaries featuring user-friendly interface with advanced Look-up function and comprehensive vocabulary database with advanced voice output. These models come equipped with our award-winning Vector UltimaTM spell-checker and contain useful English grammar resources as well as enjoyable linguistic games to improve your skills while you play. Other features such as world time, metric and currency converter utilities, etc. are also included. ECTACO Partner EPg500 English <-> Portuguese - Talking Electronic Dictionary and Audio PhraseBook The ECTACO Partner EPg500 is a unique bilingual translator that combines all the most useful linguistic resources in a single, affordable handheld package for complete understanding anytime, anywhere. ECTACO Partner EI500 English <-> Italian - Talking Electronic Dictionary and Audio PhraseBook The ECTACO Partner EI500 is a unique bilingual translator that combines all the most useful linguistic resources in a single, affordable handheld package for complete understanding anytime, anywhere. ECTACO Partner EGm500 English <-> German - Talking Electronic Dictionary and Audio PhraseBook The ECTACO Partner EGm500 is a unique bilingual translator that combines all the most useful linguistic resources in a single, affordable handheld package for complete understanding anytime, anywhere. ECTACO Partner EGR530T English <-> German <-> Russian - Talking Electronic Dictionary and Audio PhraseBook. The new ECTACO Partner EGR530T is a trilingual English <-> German <-> Russian translating dictionary and so much more. Designed to let anyone understand and communicate instantly, the EGR530T features all the latest programming advances. Containing a massive 650,000 words in its comprehensive vocabulary database plus 21,000 of the most important phrases for immediate communication, the EGR530T employs sophisticated TTS (Text-To-Speech) voice synthesis to speak any of its entries aloud so you don?t have to. Perfect for anyone just beginning to explore the world of international communication, the EGR530T is loaded with the linguistic resources and extras that make all the difference when you need a reliable, portable companion to help make sense of the world in another language. The Deluxe models of our remarkable and unique P800/P850 and iTRAVL devices come complete with the little extras that make all the difference. With the included C-Pen/Ectaco Handheld Scanner you can grab, scan and translate entire texts from wherever you find them - in a newspaper, on a theatre program, a doctor's prescription or even from a poster on the wall - scan it, upload it instantly, and get a translation into your chosen language right away! In addition, the iTRAVL Deluxe comes complete with a fantastic hands free/eyes free Car Infotainment System to let you learn languages during your drive into work so you can make the most of your "down time". Perfect for language enthusiasts and travelers, the iTravl was created to help you start communicating in any language right away. Speech to Speech recognition allow you to say one of thousands of phrases for an instant translation. The Language Teacher program helps you learn a language through interactive courses while correcting pronunciation and giving you tips along the way. Scan and translate using the CPen. With the amazing language learning courses built into the Partner 900, the added CPen now allows users to scan any text they want and have it translated. Phrasebooks, speech recognition, and human voice pronunciation add to the miraculous features of this device. Absolutely unique in the world of handheld language and travel assistants, the iTRAVL Deluxe includes everything the business or leisure traveler needs to make visiting foreign destinations an enjoyable and easily navigated experience. Loaded with a full range of the most useful communication tools. By simply speaking into the iTRAVL Deluxe, you can have your phrases instantly translated and spoken aloud using a sophisticated combination of speech recognition modules, real human voice output and speech synthesis. Helping you to enjoy sightseeing more, meet new friends and deal with emergencies, it is loaded with a full range of the most advanced language management tools ever combined and includes iHELP which lets you immediately access a list of emergency or most frequently used phrases instantly. Thanks to its remarkable Speech Recognition modules all you have to do is pronounce a voice tag and iTRAVL Deluxe will speak the phrase immediately. A real life saver! The Partner C-4 series represent our newly released, fully expandable, professional-level talking dictionary with two high-quality screens that open like a real book to offer an enhanced translating and reading experience. Featuring an absolutely exhaustive vocabulary these unique devices employ the latest text-to-speech capabilities and come pre-loaded with 14,000 indispensable phrases that can also be spoken out loud in a real human voice as recorded by native speakers. The ECTACO Partner C-4ML8 is a fully expandable, 8-language multilingual professional-level Talking Dictionary and e-Book. With two high-quality screens that open like a real book, it offers an enhanced translating and reading experience while taking up a fraction of the space. An absolutely exhaustive dictionary contains more than 4,000,000 words to make translating between English and Spanish, French, Italian, German, Portuguese, Russian, Polish easier than ever before. ECTACO Partner C-4P English <-> Polish Professional Talking Electronic Dictionary & eBook The ECTACO Partner C-4P is a fully expandable, professional-level Talking Dictionary. With two high-quality screens that open like a real book, it offers an enhanced translating and reading experience while taking up a fraction of the space. An absolutely exhaustive dictionary contains more than 1,000,000 words. ECTACO Partner C-4R English <-> Russian Professional Talking Electronic Dictionary & eBook The ECTACO Partner C-4R is a fully expandable, professional-level Talking Dictionary. With two high-quality screens that open like a real book, it offers an enhanced translating and reading experience while taking up a fraction of the space. An absolutely exhaustive dictionary contains more than 1,000,000 words that includes the specialized professional vocabulary used by legal, medical and IT professionals. Lightweight and super-portable, ECTACO jetBook is the ultimate pocket library. Capable of storing thousands of books in the world's most popular languages, plus music and picture files, it is a universal mobile library for professional, business and leisure reading. With an easy to scan high-resolution 5-inch display and a viewing angle close to 180°, it is fully customizable. Even readers who have difficulty seeing print books will benefit from its adjustable text size and font face. And weighing in at only 7,5 ounces, this handy device fits perfectly into the palm of your hand. ECTACO is happy to present you its second line of electronic eBook readers: ECTACO jetBook Lite - the most affordable eBook Reader on the market with better performance than in most of its competitors. 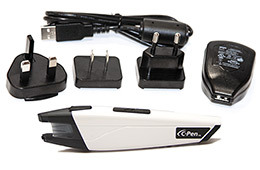 The C-Pen is an affordable and reliable handheld data entry alternative to fixed desktop scanners. Letting you capture the exact segment of the text you need, it instantly inserts scanned data into the desired field within your applications. Seamlessly integrating with the software you are already using, you can now scan from curved, laminated and patterned surfaces - something standard scanners just can't do. Don't forget your business colleagues!